An accurate air situation picture and rapid response times are essential in a military scenario, which is why the concept of remote tower for military use and Frequentis’ shared situational awareness framework have been put into the spotlight. The Frequentis shared situational awareness framework, designed specifically for the defence sector, allows customers to address inter-agency collaboration, improving response times and the coordination of resources in the event of a national crisis. The group of solutions can be tailored to meet customer needs in a scalable and evolving system. When integrated with the Frequentis state-of-the-art communication systems, it provides a unique cross-domain command and control tool. In terms of military tower control delays due to loss of tower services, or even just poor visibility due to bad weather, could be catastrophic to a mission. This is where remote tower can play a pivotal role, replicating the visual tower view to provide ATC services from remote locations, consequently improving operations and enhancing safety. Air defence solutions have played a key role in Frequentis’ 70-year history, starting with communication systems for the Austrian Armed Forces and the German Armed Forces, who have had a successful working relationship with Frequentis for more than 25 years. What’s so interesting about this is that at the start of this relationship, and up until around 1990, it was forbidden for the German and Austrian Armed Forces to work together. However, Frequentis was able to work with both forces individually and enabled a strong cooperation. Today military organisations and authorities in more than 40 countries use Frequentis solutions, including the US Army, UK Ministry of Defence (MoD) and the Australian Armed Forces. 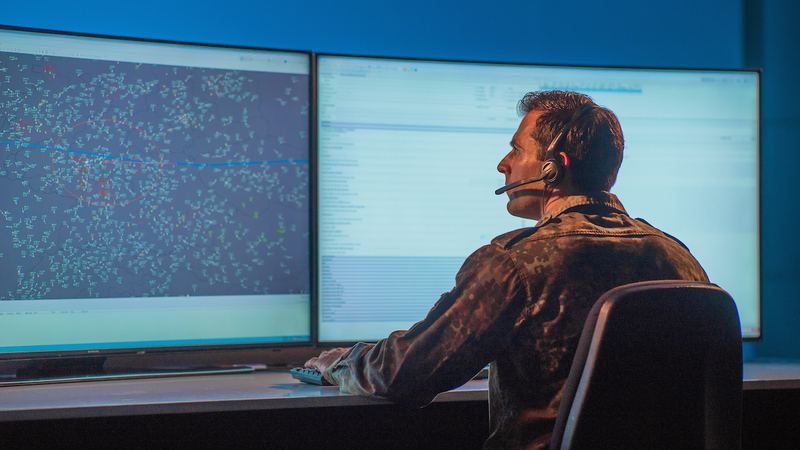 Frequentis’ shared situational awareness framework is already in use today for the German Armed Forces. The National Air Policing Centre (NAPC) combines numerous data sources from widely disparate military and civilian systems into a single, easy to use HMI that is coupled with a fully integrated red/black communication system. This gives unheralded access to red/black landline and radio communications together with ‘click-to-dial’ functionality. Real-time situational awareness is a core element to NAPC and this is a first step toward wider capabilities that will enable this functionality across military forces. Mission-critical communication, information and surveillance systems are the core offering for Frequentis’ defence domain. In the UK, Frequentis is currently working on the Marshall program for the MoD, providing essential voice communications systems for all airfields, air bases and air force areas. In Australia Frequentis is providing its market-leading voice communication system for the OneSky program, which will deliver the world’s first fully integrated civilian-military air traffic management system to the entire Australian continent. The US Army also selected Frequentis to upgrade tower communications at US bases and those abroad and is delivering the milATC communications for their most critical vertical lift maneuvers. A training curriculum has also been developed by Frequentis and is now delivered from its factory in Columbia, Maryland.